Jim Gaertner, Sam Houston State University president, will recognize service and award recipients and give his annual state-of-the-campus message on Thursday (Aug. 28). The campus-wide meeting is scheduled for 2 p.m. in the Beto Criminal Justice Center's Killinger Auditorium. In addition to his message about the university, Gaertner will recognize staff excellence award recipients and service award recipients in five-year increments beginning at 20 years. 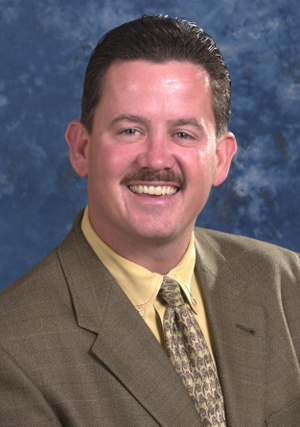 SHSU alumnus Dan Davis has come “home” to SHSU as the new director for the university’s Office of Contracts and Grants. A 1970 graduate with his bachelor’s degree in business, Davis began in the position on Aug. 4. As director of the office, he is responsible for the administration of all contracts and grants awarded to SHSU, including “insuring compliance with the terms specified by the sponsor, filing all financial reports and billing the sponsor for research or service conducted,” he said. Growing up on the University of Texas at Austin campus, where his father was a professor and chairman of the journalism department for 35 years, Davis is no stranger to higher education. He has served as the assistant director for business affairs with the Texas Engineering Experiment Station of the Texas A&M University System and as assistant director for fiscal affairs with the University of Texas Health Center at Tyler. His efforts as associate vice president and executive director for technology development at the University of Oklahoma led to the creation of 32 companies, raised more than $60 million in capital and generated more than $20 million in cash and equity for OU and its investors. It also led to an increase in funded research by more than $5 million in 2005 and 2006. Previously, Davis also spent 15 years working for the Houston Advanced Research Center, where he managed the development of a collaborative research campus, leading to the creation of a state entity to facilitate contracting with the federal government, the acquisition of a $22 million supercomputer and the center’s successful management of the efforts to attract the Superconducting Supercollider to Texas. “My career has been in higher education, indirectly,” he said. “I like the environment and was looking for the opportunity to get back into higher education. “It’s a beautiful campus, and I really enjoy being here,” he said. Miles McCall, president of Lon Morris College, will discuss the benefits of the first year experience and other extracurricular activities on Tuesday (Aug. 26). The Student Activities Leadership Initiative lecture will be held at 3 p.m. in the Smith-Hutson Building’s Haney Auditorium. 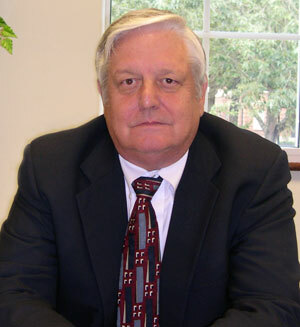 McCall became the 18th president of Lon Morris College, located in Jacksonville, Texas, in July 2005. In his first year, Miles organized the college into six strategic business units, secured over $2 million in private support and created an innovative three-year business plan. Prior to his appointment as Lon Morris president, McCall taught for almost 20 years at Stephen F. Austin State University, where he was named “Outstanding Faculty Member of the Year,” won the “Teaching Excellence” award for the College of Applied Arts and Sciences and also served as vice president for alumni affairs. Miles earned his doctorate from Texas A&M University and both his master’s and bachelor’s degrees from SFA. He also attended graduate school at the University of Houston-Clear Lake City. The Student Activities Leadership Initiative was established in 2006 “in an effort to bring in speakers and lecturers that can really be an influence on our current students,” Cooper said. Student Activities works closely with the colleges and departments to bring in one to two speakers per semester who can relate to their particular areas of interest. Students or faculty members who are interested in spending a semester or even a year researching abroad will be able to learn about traveling with the help of the federal government on Monday (Aug. 25). Paetra-kei Hauck and Christine Moss, from the Houston Institute of International Education, will discuss “Fulbright Opportunities Abroad for Faculty and Students” from 3-4 p.m. in Evans Building Room 417. “Fulbright has all kinds of things for faculty and students,” said Debra Andrist, chair of the foreign languages department, who spent the summer in Morocco through the program. Sponsored by the Bureau of Educational and Cultural Affairs of the United States Department of State, the Fulbright Program offers active programs in more than 155 countries choices in every region of the world. The presentation is open to faculty members and students from all disciplines. For more information, contact the foreign languages office at 936.294.1441 or foreignlanguages@shsu.edu. Screaming, crying, threatening, the use of profanity toward professors in the classroom: these aren’t common occurrences, but they do happen, even on the Sam Houston State University campus. Due to the rising numbers of complaints by both students and faculty members on these kinds of behavioral issues happening in the classroom, the foreign languages department will host a “Student Behavior Management Techniques” seminar on Monday (Aug. 25). During the presentation, held from 4-5 p.m. in Evans Building Room 417, associate dean of students Jeanine Bias will give faculty members from all disciplines tips on what to do if confronted by these types of issues. “People aren’t aware of how you deal with this, so we’re trying to help the faculty help people learn how to handle things so to get them resolved instead of putting somebody on the defensive,” said Debra Andrist, foreign languages department chair. Bias also will tell faculty members to whom they should turn for these issues, how to diffuse them, when to call the police and how you do a behavior referral to the Dean of Students’ Office, as well as dealing with parents in these cases. “Our concern is really for the students, that faculty members need to help students learn how to address their concerns so that they get some results so that they aren’t throwing them out of their offices or classes,” Andrist said. The SHSU art department will highlight three of its new faculty members in its first exhibit of the semester Sept. 2-19 in the Gaddis Geeslin Gallery. An opening reception for the “New Faculty Spotlight,” featuring the works of Buster Graybill, Jasmyne Graybill and Summer Zickefoose. will be held on Sept. 3, from 5-7 p.m.
Jasmyne Graybill's "Soap-Cracked Fantail," a piece made of polymer clay and a drain stopper, is one of the pieces that will be on display during the "New Faculty Spotlight" exhibit in the Gaddis Geeslin Gallery Sept. 2-19. One of Austin Museum of Art’s “20 to Watch: New Art In Austin” for its 2008 exhibit, Buster Graybill was awarded a fellowship to attend an artist residency at The Skowhegan School of Painting and Sculpture in 2007. He earned his master’s degree in sculpture this year from the University of Texas at Austin and his bachelor’s degree from the University of North Texas. Jasmyne Graybill has exhibited throughout Texas, including solo exhibitions at Cactus Bra and the UTSA Satellite Space in San Antonio. She received both her bachelor’s and master’s degrees in painting and drawing from UNT and the University of Texas at San Antonio, respectively. 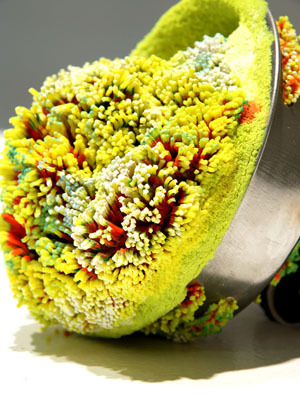 Through her sculptures, she investigates the processes of adaptation, taking household objects and cultivating fictional versions of lichen, mold, fungus, and barnacles on their surfaces. “Commenting on nature’s uncanny ability to adapt in synthetic environments, these intricate sculptures address the struggles that ensue when the human desire for order clashes with the natural order of life,” her artist’s statement said. Both Graybills, who are married, will be teaching the department’s new “Workshop in Art Studio and History” program. Completing a tour of the Midwest that included Iowa, Ohio, Wisconsin, and Indiana, Zickefoose will be teaching ceramics and three-dimensional arts at SHSU. Zickefoose earned bachelor’s degrees in studio art and art history from the Univeristy of Iowa and her master’s degree in multi-media and ceramics from the University of Florida. Her multimedia artwork is deeply influenced by Midwestern and rural American culture and landscape and seeks to reveal the archeological information within common materials and sites, ultimately transforming the ordinary into the iconic. The Gaddis Geeslin Gallery is located in Art Building F and is open Monday through Friday from noon to 5 p.m.
For more information, contact Debbie Davenport Harper, art department audio/visual librarian, at 936.294.1317or ddavenport@shsu.edu. A new book by a Spanish professor tells the true stories of “singing” Cuban political prisoners in the early 1980s. “En Cuba Todo el Mundo Canta: Memorias Noveladas de un ex Preso Político,” by Rafael Saumell-Muñoz outlines his personal experiences as a political prisoner from 1981-1986 at four maximum security prisons: Villa Marista, La Cabaña, Combinado del Este and Guanajay. “At the same time, the counter-intelligence police used that name to identify its headquarters (Villa Marista) where every prisoner ‘sings’ or confesses the political crime(s) he/she had ‘committed,’” Saumell-Muñoz said. His book, written and published in Spanish, also discusses historical events related to the Cuban regime, the former Soviet Union and its satellites in Eastern Europe. “In the book I include many voices I heard during my prison ordeal: those from other political prisoners and common criminals,” he said. “En Cuba Todo El Mundo Canta” was published by Editorial Betania in Madrid, Spain. It can be purchased for $20 through Saumell-Muñoz at saumell@att.net or Felipe Lázaro, from Editorial Betania, at ebetania@teleline.es. Additionally, clips from Saumell-Muñoz’s “Todo el Mundo Canto,” which he describes as similar to “American Idol” in format and purpose, can be viewed on www.youtube.com.